Designed to store all your frozen goods in your line of sight, this great bottom freezer refrigerator is efficiently comfortable to use. 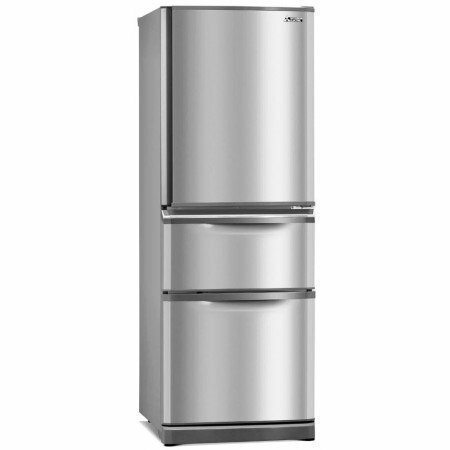 The Mitsubishi Electric MRC375GSTA Refrigerator comes equipped with 3 doors and a ground level freezer, made for lowered access. With an ice maker, you'll be able to prepare icy refreshments anytime you want. It features spill-resistant shelves, designed for fast and easy cleaning, and a humidity-controlled crisper drawer, which enable you not to throw spoiled produce away as often. This refrigerator's mark-resistant finish enables effortlessly maintaining a clean looking kitchen. The helpful open-door signal of this fridge will notify you if the door was partially closed. If you're looking to buy a new fridge, it is what you've been looking for.